I received the Lil' Dimples Santa Claus, Ralphy the Reindeer, and the Toy Soldier in Blue. 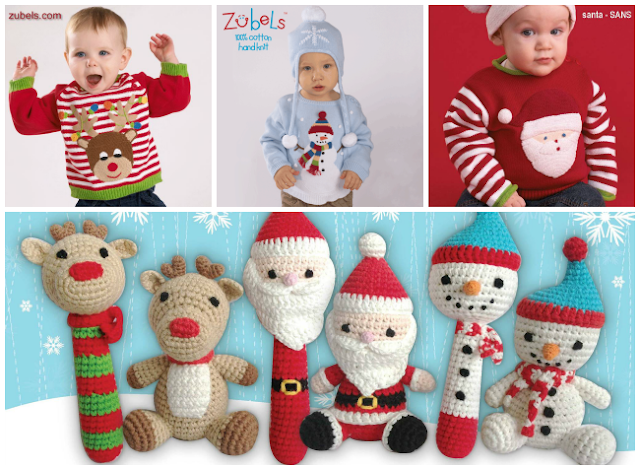 Each Zubels are hand knit with 100% super soft organic cotton yarns. I have included Zubels in my Holiday Gift Guide because they really are high quality toys that my children love and can be passed down as well. I think they are adorable and make a great gift. Being hand knit, I think they add that personal touch as well. You can follow Zubels on Facebook to stay up to date with product info, discount codes, and fun giveaways. You can use code SM20 at check-out for 20% off your order! I received complimentary products to provide this post. All opinions are my own. If you would like to see your product featured in our Holiday Gift Guide, please feel free to contact us. Zubels are so nice for the holidays. I would love to get a few of them to decor my home for the holidays and my kids would love them. Thank for sharing a cute and fun toy. Zubels are adorable! I've got a friend who just had twins. These would be perfect from them. i love that they're hand knit. Plus, any company that practices sustainability gets an extra point in my book. These are adorable! And I love that they are eco-friendly. Pretty sure my daughter needs that Santa sweater. I've never heard of Zubeles. All the items you have featured here are very cute. I have at least a few new borns I'm looking gifts for.. and will be checking this store. I think my neighbor would be into this for her mantle. She likes stuff like this for the different holidays. I can see the little Santa being used as a tree ornament as well. Aww these are the cutest! I love the incredible quality. I prefer handmade anything if I can help it! These designs are absolutely adorable!